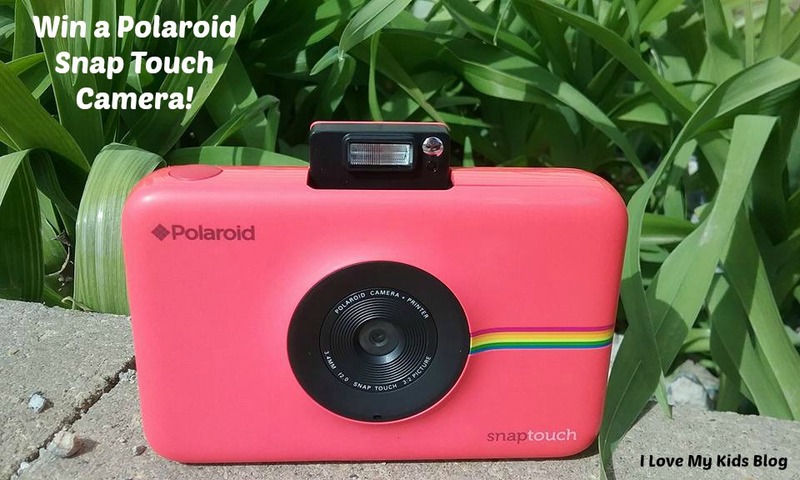 Polaroid Snap Touch Camera Review and Giveaway! 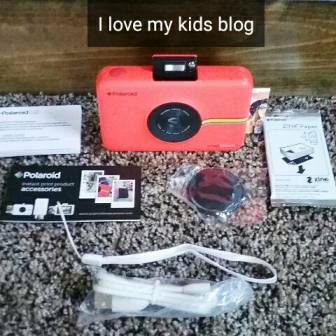 I’m so in love with this fun Polaroid Snap Touch Camera! First off, it is adorable! Second, it has all the features the old Polaroid cameras that my parents used to use, but now has advanced modern day technology built right in. This camera is packed with so many cool features that I can’t wait to tell you about. I received the opportunity to review this camera and had no idea there was so many things it could do. Everything you read in this post are my honest thoughts about it this camera. I hope you enjoy the review! The packaging is really easy to remove the camera and all the accessories that come with it. It came with a user guide, an accessories manual, wrist strap, 10 pack of ZINK printer paper and the actual Polaroid Snap Touch Camera itself! I received one this cute red color! Totally fits my style! 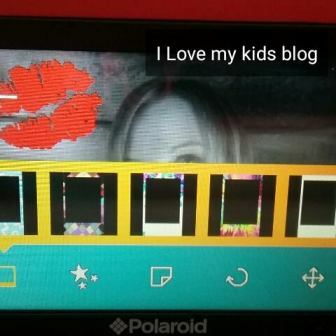 To turn the Polaroid Snap Touch camera on, just press the power button on the top. This will open the flash and automatically turn on the camera. When I turned it on for the first time, I was able to choose the language I wanted and set the date and time on it. On the bottom of the camera, there is a spot for a charger (which it comes with), an SD card slot to add more memory if needed, and a connection for a tripod. The camera also charged with my cell phone charger, so I can charge it on the go!The Snap Touch features a timer option so you can hurry into the photo too! Before I started anything, I wanted to add the paper. 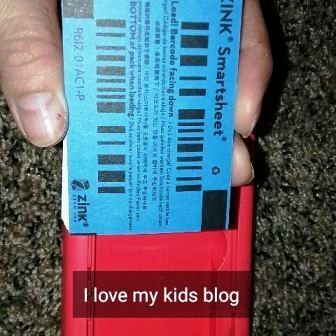 I took the ZINK paper out of the package and saw the blue “smartsheet”. You load this face down and it helps improve print quality. Loading the paper is EASY! On the side of the touch screen there is a black button and when you press it, the film drawer door pops open. I loaded the paper in with the “smartsheet” face down. Now that my paper was loaded, I instantly knew the very first picture I wanted to take and print with my new fun camera. I am a memeber of the Parent Teacher Organization (PTO) and I also drive a school bus for my kid’s school. Another Mom on the PTO happens to be the Mom of my very first stop EARLY in the morning-as they live 35 minutes from where I park the bus. At our PTO meeting one afternoon, she said, “that sunrise was sure beautiful this morning, wasn’t it?” I agreed. Another Mom said, “Well you need to take a picture for me, because I will be sleeping at that hour!” The next morning the sunrise was gorgeous! So what do you think I did? I went right out there with my Polaroid Snap Touch Camera, snapped a photo, and printed it for her! It was fun to actually take a picture for her and print it to give to her! It cracked us both up! Today happens to be mine and my husband’s 13th wedding anniversary! He said he wanted a picture of me and one of the kids for his wallet since our wedding picture he used to carry has deteriorated over the years. This camera prints perfect size 3″ by 2″ photos that are perfect for wallets! So this morning while he was at work I snapped a picture and began playing with the camera’s fun features! It offers 5 different effects so you can make every picture just right! The camera has crystal clear images. For the purpose of this review, I took pictures of the camera with another camera. The camera images may appear distorted but they aren’t! They are lovely! It also has a frame option, to make them look like the classic Polaroids we grew up looking at. Some of them are plain and some are fun patterns. I also added a “sticker”. There are a handful of them to choose from, including sunglasses, heart, lips and more. You can move them and size them with your finger on the touch screen. I opted for a set of red lips and to tint my photo with the black and white effect. The two end options are a rotating feature and a type of cropping feature that allows you to zoom in and out of the original captured image. When I was all done editing my image I clicked the back arrow and on the main screen I hit the print option. It allows you to choose how many prints you want of the selected image. I chose one print then clicked the print icon. The touch screen is very responsive as long as you are using direct contact. It doesn’t react well to my fingernail pressing, so I’m always sure to use my fingertip. When it begins to print it just prints out the side of the camera. So COOl! Within 20 seconds my photo had printed! It was fast, easy, no waiting, no ordering online, it was really nice for a last minute addition to his anniversary gift! The pictures print dry to the touch and no more of the fanning the photo back and forth to make the image appear! The print quality is pretty impressive for the size of the paper and the fact that I can print it from inside a camera! It looks better than what I could print at my own home! It was pretty fun to be able to hand that to him tonight. I need to spend more time playing around with the Snap Touch so I can learn to edit the images even better. An additional bonus to the Polaroid Snap Touch printing your pictures right then and there, is the ZINK paper is also a sticker! Just peel the backing off and you’ve got a custom sticker! Super fun! I’ve only briefly touched over a few of the features so far and still haven’t covered all this camera offers! The camera has a cool feature called photo booth. 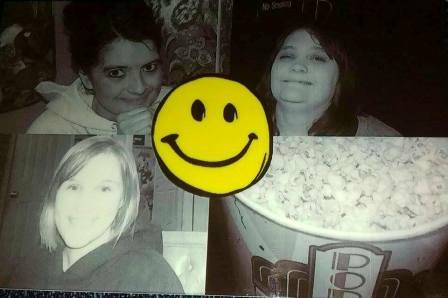 On the main screen, you press on the options button choose, photo booth, and then choose 2, 3, or 4 photos. Using the camera you can take up to 4 pictures. Today my friends and I went to the theater and tried this feature out! It was super fun to use and we had a good laugh! The lighting behind me was quite bright compared to them, so I used the black and white effect option to even it out a bit. We had a fun time with it! I even added a smiley face sticker to the middle of it! 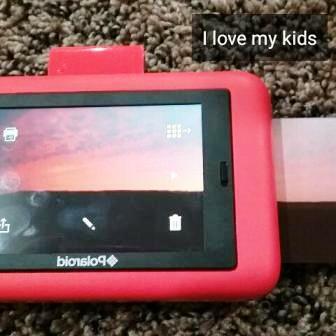 You can connect your phone to the Snap Touch via Bluetooth and print pictures FROM your phone on the camera. NEAT, right?! There is a selfie mirror and other fun features I need to explore more on this camera! I’ve taken it to soccer with me, to school, to the park, to the theater and no matter where I go with my Polaroid Snap Touch, it’s always the topic of conversation. 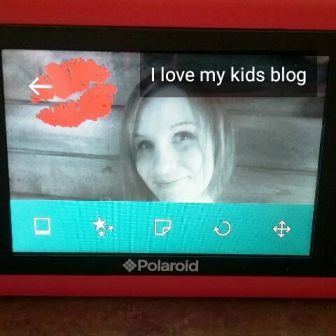 It has the great qualities like the good ol’ Polaroids we all used to love but with the fun editing features we all enjoy now! 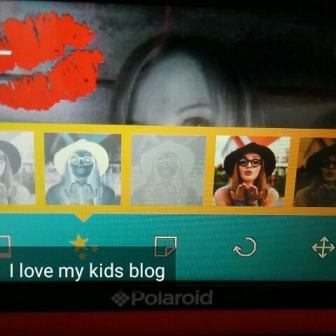 The Polaroid Snap Touch retails for $179.00 on Amazon and comes in 6 different colors! The ZINK printer paper is also available on Amazon. The 20 pack is $9.99, the 30 pack is $14.99 and they have other options and kits available too. Check it out! This past holiday season, Polaroid gave fans a chance to participate, engage and win wonderful products during its #PRINTitFORWARD campaign. Polaroid is continuing the campaign beyond the season of giving to provide even more surprise and delight in 2017, and would love to offer a giveaway in honor of #PRINTitFORWARD! 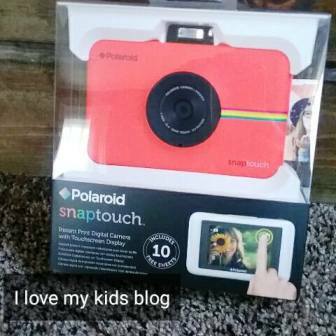 One VERY lucky I Love My Kids Blog reader will win a Polaroid Snap Touch camera! You definitely want to enter to win this one! Congratulations to our Winner Bridget W.! Bridget, you have 24 hours to reply or a new winner will be chosen! Thanks to all who entered! 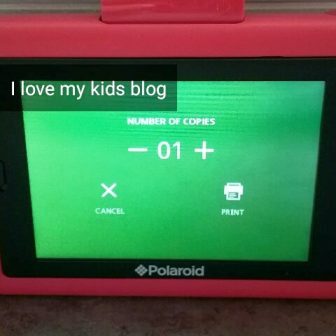 Thank you for reading my honest review regarding the Polaroid Snap Touch Camera! This giveaway is sponsored by Polaroid. Affiliate links are present. Good luck on the giveaway! I LoVe the blue camera! So fun!! It takes me back to the good ol’ days of the original Polaroid black square cameras. Would love to win one and share the joy with my kiddos!!! any color.. i love the fact that its instant.. i used to have the bigger one & loved i didnt have to wait. I love the light blue camera! 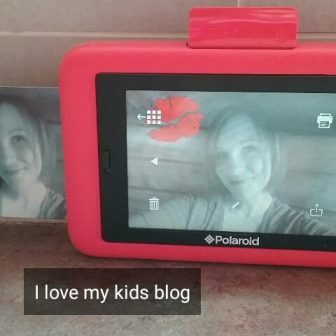 This would be so awesome for on the run pics of my kiddos! I love that you can print right from the camera. I really want that feature!! 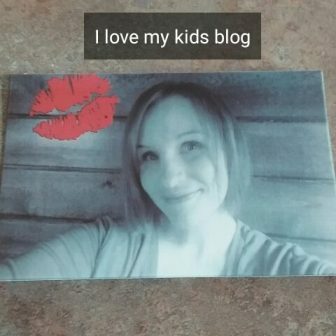 Awesome blog and giveaway! This camera looks so fun! Loved your review. I really want one of these now. Not sure what color I would pick though. I love the blue camera, it’s such a pretty shade of blue! Hey Cj!! 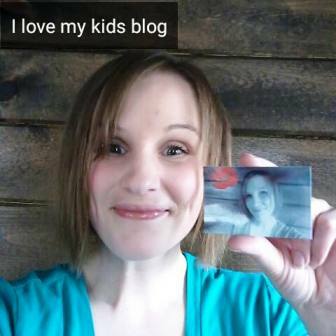 I love everything about this, but mostly the fact you love your kids!! Hope you’re doing great. ? Oh and this camera looks super fun! I love that you can print right from the camera… brings me back to the good ol days, playing with the Polaroid camera!! Haha. Take care! How fun these look! I would love to give a red one to my great nephew! I would really love it in the Blue. My daughter’s friend got one of these for Christmas and she has been dying for one ever since. It actually is the first thing on her upcoming birthday list so it would be great to be able to give it to her for her birthday. I love taking pictures and Polaroid is such a good brand. This would be a magnificent camera for my household since I go to many parties and family functions. I like the pink one the best. Pink is my favorite color and I would love having one of these in pink. Thank you. I like all the colors. but red and purple are my favorite. I love the pink on so cute! I love the blue or white perfect for summertime, so excited, thanks for the chance! fingers crossed! Really Love the Purple Camera! I really like the color choices and would pick the red. I pick the PURPLE !!! I would like the white camera best. I loved my bulky polaroid when I was a kid. I was snapping pictures all the time. I love this one and how small it is! I would like the purple color. These sound great, I would love to have one. I would chose the black. I love the pink one the best. Such great new features you can use to dress up your pics. I like the blue one the most! I would love the purple one!!! I would really like to share the white color option with my family. My sons are little budding photographers and this is the perfect easy to use beginners choice for them. I love to have a pic instantly printed out. These is another great camera invention! Love this! Love the blue!! I would choose the black (bc my hubby would prefer it) but the blue really pops! I adore the PURPLE camera! I really love the blue! I’D LOVE TO HAVE A PURPLE ONE! I love that you can print from your phone! Blue! In it to WIN it! Thank You!!! I like the blue, pink, or red camera!! So fun!! The purple camera is very pretty! 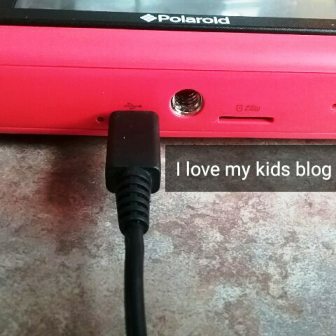 I don’t think my son would mind using it either. I love the white for my kids! I like the RED and I love that that the picture comes on out. Instant Gratification. I like the bright blue color the best. I really like the fact that you can print your pictures instantly. It’s interesting that something so small can have a built-in printer and that there is no ink or toner cartridges to contend with. My favorite color is pink, so I love that one the best. I’m a huge fan of the white color. I like the purple one the best. That’s the color I’d choose if I won. I love that you can print pictures directly from the camera! I’d love the purple!! I would choose the purple one – it is my granddaughter’s favorite color! What fun!! Brings back some great memories…Hope I win, so I can make new ones! I would love the purple! My favorite color! I like the black and the purple colors best. I love the Purple Polaroid Snap Touch! Loved those Old School Polaroids too!! My favorite is the purple. I like the black camera, I would love to give this camera to my grandson for graduation. I’m liking the white but my granddaughter said ‘Purple’, PLEASE!! I love that the camera is smart phone compatible and you can get different stickers, filters and borders to use on the pictures that are taken. Plus the way it prints is pretty sweet! I would love to win a blue camera! These cameras are oh so cute. The turquoise blue color is my favorite. I would choose the White, I love it! It would be perfect for our upcoming vacation! Love the purple one! ? I love all the colors! Especially blue, white and pink! I also love the instant gratification! I would love to win the purple one. I would love to win this because I love to take pictures. I love the purple camera! I love the purple and the blue. I would be thrilled with either color. Very cute cameras with excellent features. I like the pink and if I do pink my husband will not steal it from me! I really like the red Polaroid the most, but the other colors are cool too. Thanks! I would love to give my daughter the red one. I really love the blue one.. I think I would pick the blue one! I would love the red one. I would gift this to my husband, who can’t find anything. He should be able to see red. I like the blue color the best. I would love to win this for my daughter. I would choose the white camera. Awesome that you can print photos instantly! I like the Pink colored Polaroid Snap Touch the best. I would really love the Pink one for my Grand daughter She is a PINK fanatic!! I really like the purple colored one. My favorite color of the Polaroid Snap Touch Instant Print Digital Camera is RED. This camera looks amazing. Thank you for the giveaway. The color of the Polaroid Snap Touch I like the best is purple. Thanks for the fantastic opportunity to win! Diggin’ the red color, thanks for the chance!